purchase one of my art works, including my most recent series of small assemblages and sculptures ‘Made in Bahrain’. 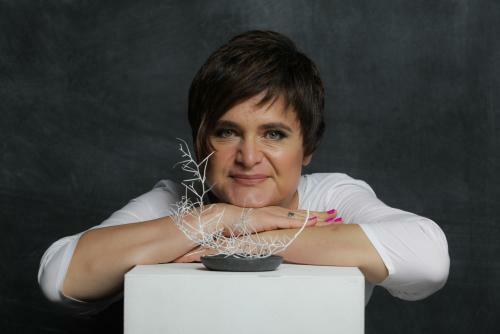 Born and grown up in southern Germany, Eva Graf began already at the age of 13 to create her own artistic designs in furniture, jewellery, sculptures and paintings. Her love for creating the unique accompanied her throughout her life in a number of different opportunities and positions to a curious filled artist, interested in exploring and experimenting with a variety of exciting art forms in Cuba, Venezuela, and Brazil.Before moving to Bahrain, she was working and exhibiting in her own art center at the Silver Street Studios in Houston. 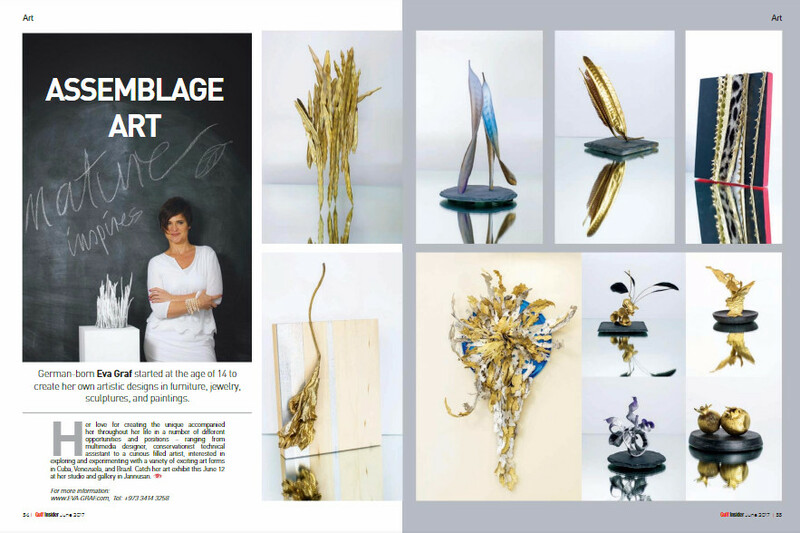 In June 2016 she opened up her latest art studio & gallery at Al Hilal Gardens, in Jannusan………..read more in my latest article in the weekender Bahrein…..
As a German artist I will present my latest series of artworks such as mini sculptures, medium-sized objects and large wall-montages. 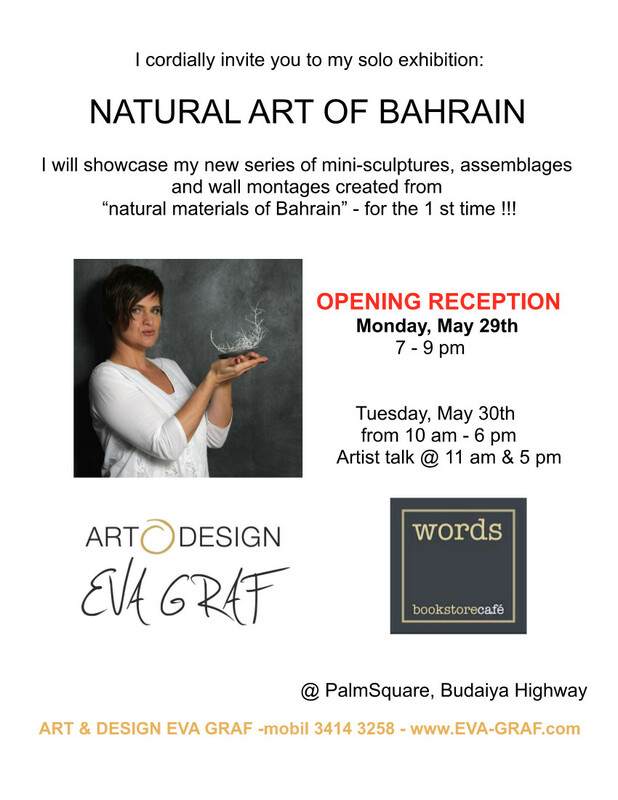 Being a resident of Bahrain for 2 years, I will show an entire collection of my works created from “natural material of Bahrain” – for the first time. The inspiration for my art work comes from nature and from nature only. Everywhere I’ve been in Bahrain, I collected pieces of bark, dessert grass and other natural objects. I love to use these materials to create artworks and present the pieces of nature with a ‘twist’. Getting ready for my 1st Solo Exhibition in Bahrain!! Be prepared! I’m getting ready for NYC! 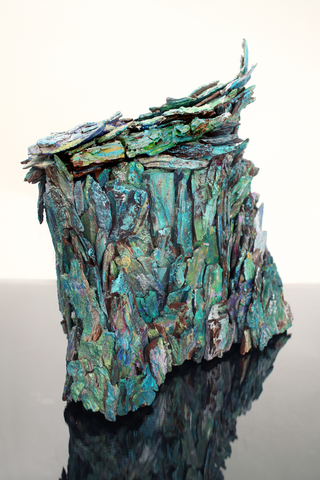 3 of my sculptures are in a exhibit in Tribeca! The show takes places on November, 5th, 2016! One of my sculptures is part of it!!! 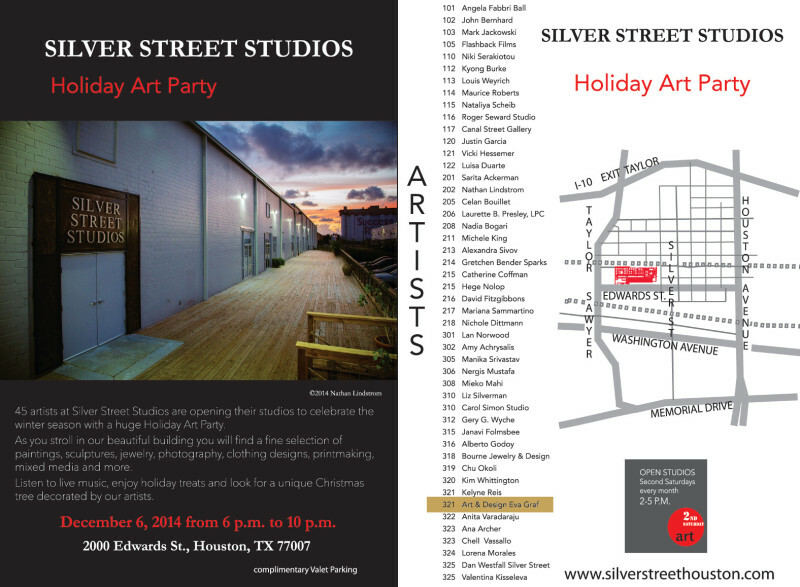 Come and join the event at Winter street studios, Houston, Texas, USA. My Art Studio will be open to all art lovers. I have recently resumed my work as contemporary artist – now in Bahrain. My studio in our villa is finished and the surroundings give me a lot of inspirations for creation of my assemblages and paintings. My art works are put on display and I will be available for discussion about my work. I relocated with with my studio # 321 to the Kingdom of Bahrain, Middle East! I’m excited to announce that my sculpture SPACY TRACY has been selected to be part of this show. 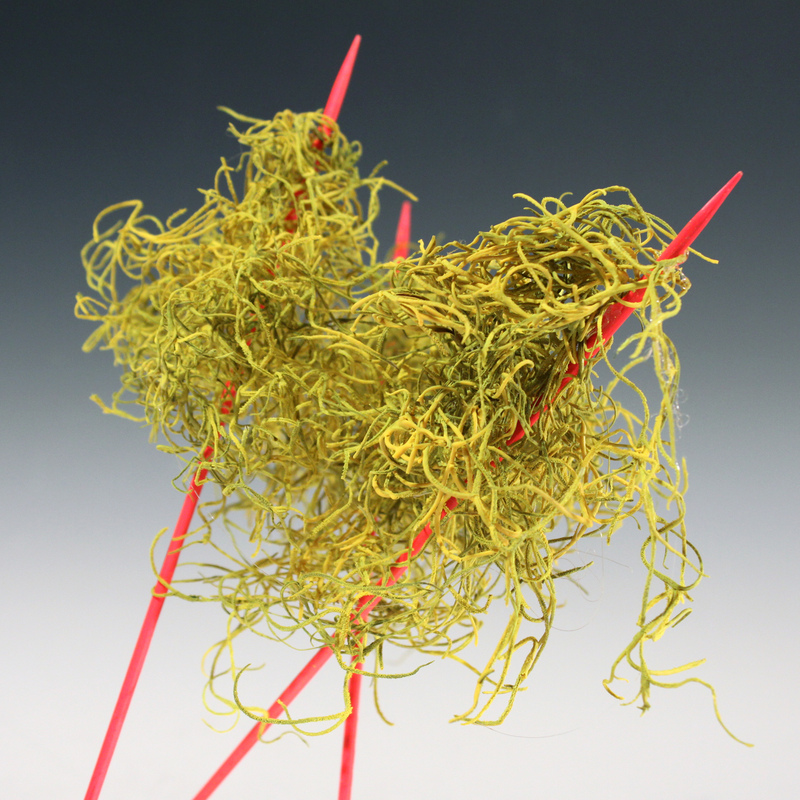 The 32nd Juried Open Exhibition was open to VAA members and non-members. In all 598 entries were submitted by 165 artists from 17 states and one country outside the U.S. 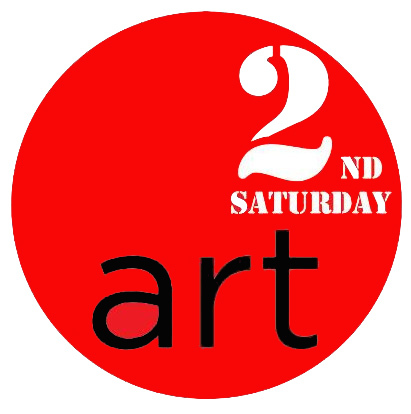 Noted independent art curator Sally Sprout will selected entries for the exhibition. 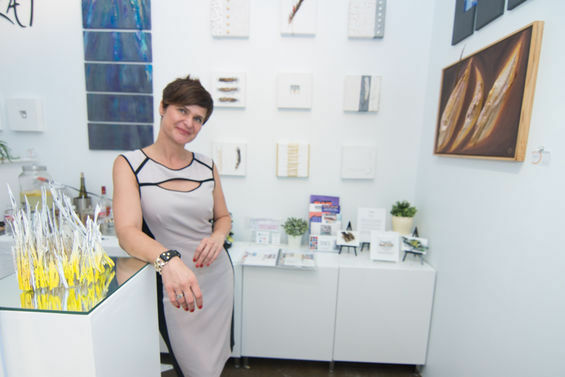 Ms. Sprout is an active member of the Houston art community, currently directing the exhibition program at the Williams Tower Gallery and acting as principal of Sally Sprout Fine Art consulting services. 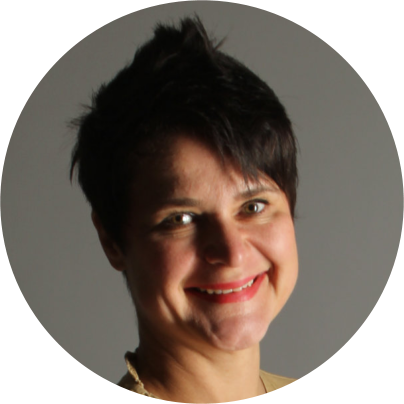 She has served as Curator of Exhibitions and Curator of the Collection for Transco Energy Company and also curated the sculpture program for The Woodlands Operating Company. Ms. Sprout has served on numerous art boards, including DiverseWorks Art Space Inc and Houston Center for Photography and is a frequent juror for city art organizations. The exhibition is open to the public through Saturday, April 11, 2015. Do you need a special present? 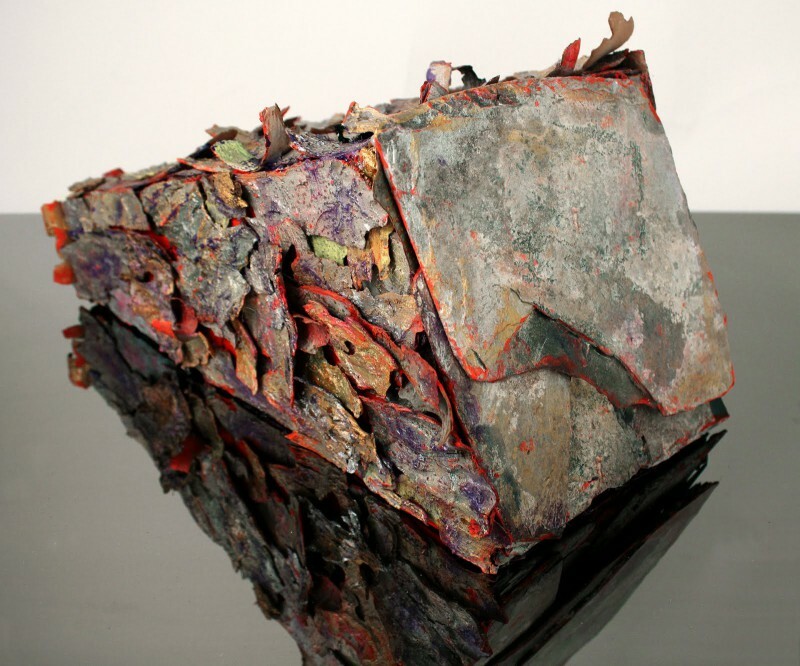 Visit my “new” studio, …sculptures, assemblages and wall montages are waiting for you! I’m excited to announce that my sculpture THE MOVEMENT has been selected to be part of this show. A portion of the proceeds will benefit Assistance League of Houston. The exhibition is on view through February 27. Gallery Hours Mon – Fri 8 a.m. to 6 p.m.
February 7, 2015 5p.m. – 9 p.m.
As an Silver Street resident artist I will exhibit my new works in a group show. @ Silver Street Studios, Corridor Gallery. ….and look for a unique Christmas tree that is decorated by myself and my colleagues. NEW !!! NEW !!! NEW!!! NEW !!! NEW !!! NEW!!! !!! ONLY AT THE HOLIDAYS!!! 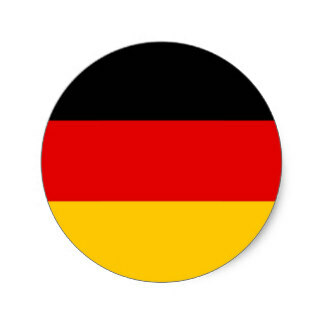 other small artistic presents like Scarfs, magnets, boards and … ! Come in and find out – be prepared for Christmas! 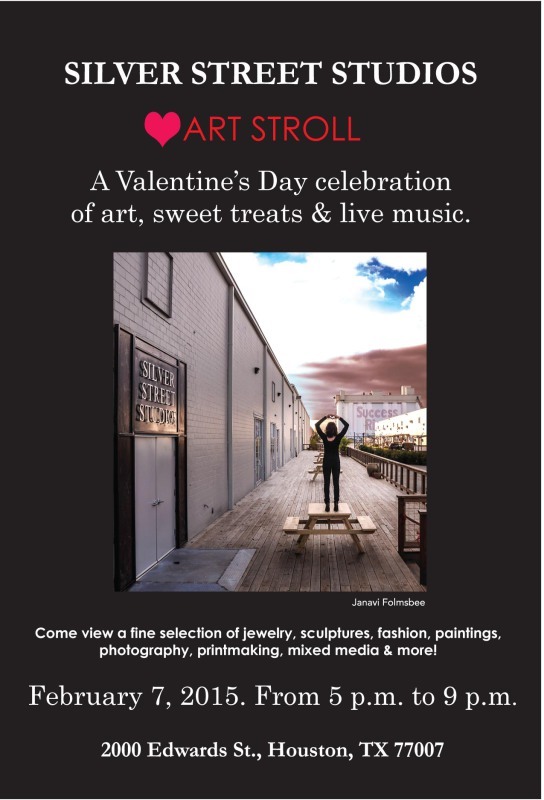 The newly designated Washington Avenue Cultural District will come alive for a fantastic evening of fine art when Silver Street Studios host their fall Bi-Annual Art Opening. The opening is free and guests will be treated to complimentary valet, light bites and beverages. Pedi-cab shuttles between all three buildings will also be available. taking place at Silver Street Studios. Made of different kinds of Texan bark. or it can even be used as a free sculpture stand. 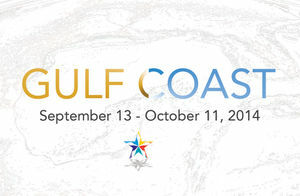 Gulf Coast is a juried exhibition of artworks that celebrate, challenge, and capture the activities, ideas and scenery that shape daily life on the Gulf Coast. 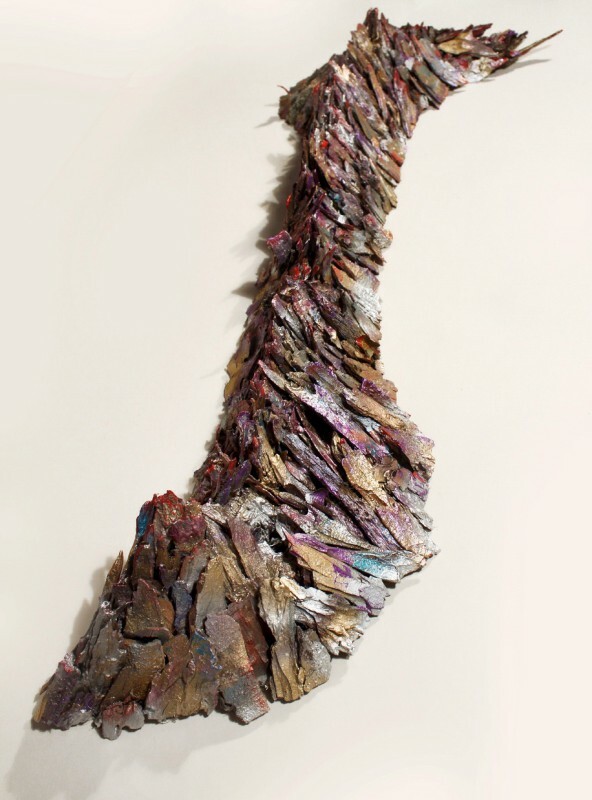 Juried by Lee Deigaard, a contemporary artist from New Orleans, LA, Gulf Coast is the first exhibition centered around this theme for Rockport Center for the Arts. July 16th, 2014 – Bill Davenport Fresh meat! A blank page! A new beginning! The annual Big Show at Houston’s Lawndale Art Center isn’t the free-for-all it was when it was literally free for all (and curated by Walter Hopps), but I always look forward to it because I’m a hoper: I’m sure the Big Show will smoke out the undiscovered talents lurking Houston area swamps and suburbs, middle schools, painting-party classes, and even university art programs. 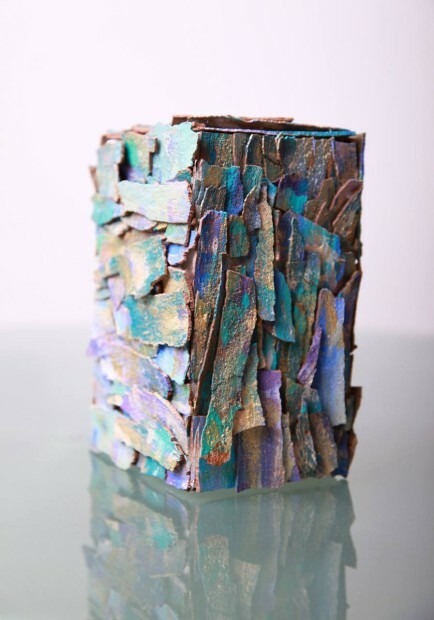 Eva Graf‘s The Cube is another curious craft project, a mini-minimalist sculpture covered in pieces of carefully painted tree bark, in decorator shades of iridescent blues and gold, as if it were a designer scarf.